The elders of the country go for Tirth yatra (visiting the pilgrimages) for religious purposes. However, due to their old age they suffer from many problems while they are on such tours. This is why the Gujarat government announced the Gujarat Shravan Tirthdarshan Yojana for such elders, which is basically a subsidy. The elders shall get a subsidy of up to 50% on their travel expenses – the Gujarat Chief Minister Vijay Rupani announced – along with other benefits. Resident Of the Gujarat – You will have to be a resident of Gujarat to get the benefits of this scheme. Residents of any other state other than Gujarat are not eligible to take part in this scheme. Age Limit – Since this scheme is for the senior citizens, you will have to have attained at least 60 years of age to avail the benefits of this scheme. Even 60 year olds can apply. Subsidy– The subsidy is given for all non-ac travel costs by buses. This means that if you are traveling via non-ac buses, then you will get 50% of your travel costs covered under this scheme. However, if you are traveling to a different state, then you will not get the benefit. You have to do the Tirth yatra within the state to get this subsidy. Secular – The senior citizens from all sects and communities shall get this benefit. This means that if you are traveling for pilgrimage purposes then you will get the subsidy irrespective of your caste or creed. But you must travel only within Gujarat. Travel Plan – Also remember, that before applying you will have to make a travel plan of 2 nights and 3 days. You will have to come together with a group of senior citizens traveling along with you. You will have to fill out the details of the travel plan on the registration form. 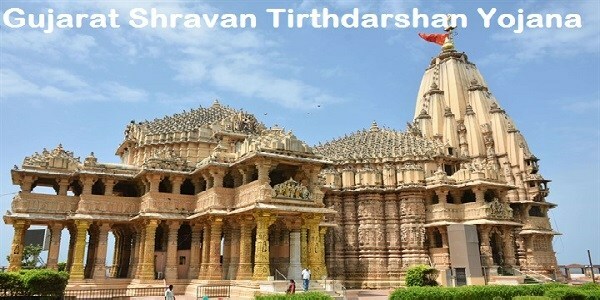 How to Fill form and Apply for the Shravan Tirthdarshan Yojana? Go to the web portal http://www.yatradham.gujarat.gov.in and then click on “Booking” you will see an option called “Registration” – click on it if you are a new user and have no login ID on this website. After that hover the mouse over “Booking” again and click on “online application” you will be able to submit the details. You will successfully have applied for a package. Make sure you also enter your age details. Once you have applied for a particular package online, you will still have to submit the offline document in order to be eligible for the benefit. Make sure that you take a print out of the copy called “SUB Deals.” With this copy you will be able to access all the details. If it is difficult to understand the form at once, simply take a photo copy of the document and then fill it out. While submitting it to the authorities, if any changes are found, you can easily fill it out in the original copy. Before making the online or the offline application, make sure you read the document enlisting the details. It comes with all the instructions. If you are eligible, that is, if you are of 60 years or above, you might also have to follow some further steps in order to get the benefits of this project. Important Documents should be with candidates? http://www.yatradham.gujarat.gov.in is the official website where you can find further details and require about the process as well. To access some parts of this website you will have to login or create your own identification. The scheme has been launched on Gujarat day in Ahmedabad. Vijay Rupani, who hails from the Bharatiya Janata party, has launched the scheme in the state. 1st May is known as Gujarat Day because it is considered the foundation day of Gujarat. On this occasion, the Chief Minister of the state launched this scheme for all the communities alike.